Preheat oven to 400 degrees and put a rack in the center position. Lightly spray a 12 cup muffin tin with non-stick cooking spray. In a large bowl, whisk together the cornmeal, flour, baking powder, baking soda and salt. In a small bowl or large measuring cup, whisk together the buttermilk, eggs and melted butter (or oil). Add the liquid ingredients to the cornmeal mixture and stir just until combined. The batter will be slightly lumpy. Do not over mix or the muffins will turn out tough. Fill each muffin cup 2/3 full. 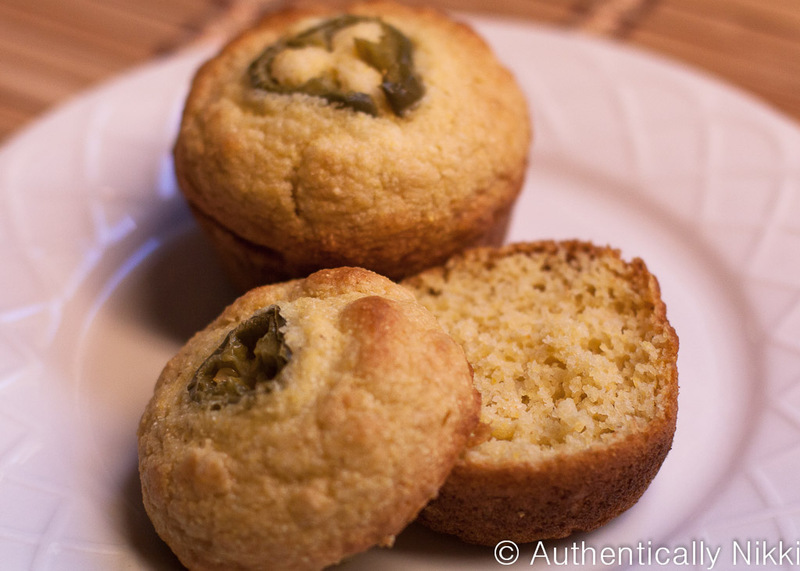 If using, place a jalapeño slice on top of each muffin. Bake until golden brown, about 18 – 20 minutes. This entry was posted in Food, Muffins and Quick Breads and tagged buttermilk, cornbread, muffins by authenticallynikki. Bookmark the permalink.